I am happy to announce that a week after Christmas, I can say that I have kept my weight off all year. I am carrying a few pounds from the holidays, but nothing I am going to stress over. I have been doing the wii fit, which I love, and I plan on continuing with that. I don't want to say I am making a resolution, but this year, I would like to lose another 50 pounds. That would bring my total to 100 pounds lost. I am not going to stress over it, but I am going to try and eat healthier. And play the wii. I think those of you who actually read this blog know that my husband's father is dying. From what we have heard, he only has days left. Junior is upset, of course. As much as he distanced himself from the man over the last few years, he is still his father. I am glad that we are still in therapy, and that Junior has someone to talk to about this. I would have loved for him to have made amends with the man, but that was not to be. I hope that this new year will bring peace to my husband. He deserves it. Life will go on...I can't believe I will be, ahem, 39 in February. I know, it's hard to believe. And that means that the year after that, I am going to be...um...I can't even type it! I am not that old! So, I am going to thank God for my little family. For my parents and siblings, and their families. For the fact that my family is close, and that we can always count on each other. 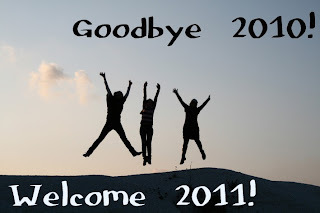 As I say goodbye to 2010, I am looking forward to 2011. I hope it is a year full of happiness and love, in my home as well as yours. I will be here celebrating your birthday with you ! !